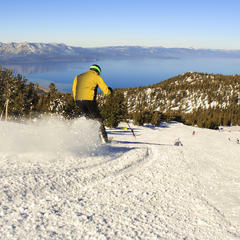 Sunny skies delivered at stellar opening day at Heavenly with views of Lake Tahoe. 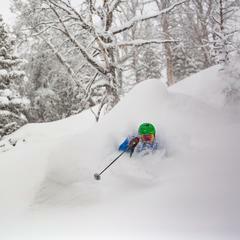 While wind may not be the best friend of a cold skier who's duking out an internal battle between the desire to carve fresh turns on empty slopes vs. the instinct to avoid frostbite, that same element is often responsible for those fresh turns to begin with. Just how does wind translate to maximum powder? Wind direction can make or break snowfall accumulation at ski areas. 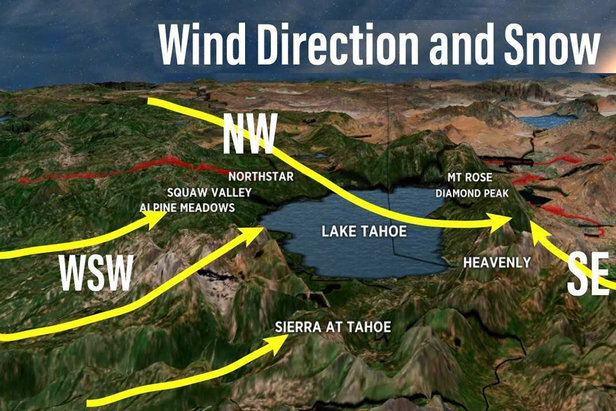 In particular, certain wind directions can set up a weather scenario that can generate heavy snowfall at Jackson Hole, Vail and Lake Tahoe thanks to the unique mountain topography surrounding these mountains. This process is called orographic lift, which is the interplay between wind and mountains. Under the right conditions, upslope flow is air moving higher in the atmosphere where air temperatures are colder. Eventually, that air hits saturation and condenses to form clouds and eventually snow at ski areas. While there are other important snowy weather factors at play, wind direction is critical depending on the terrain. You may have a simple storm system loaded with moisture, for instance, but if the wind direction is wrong, then very little snow may fall at these resorts. We want to avoid wind directions that hit higher peaks before it reaches these resorts because this creates a downslope, or snow-eating wind by the time it reaches the ski resort(s). We see it all the time in Colorado at Vail where southern track storm systems rarely generate big snow. Read on for the wind patterns that generate the best chances for optimal snowfall in these ski resort regions. Keep in mind that while other wind directions might work, they will generate less snow. The relief of the Teton Mountain Range is significant at roughly 7,000 vertical feet. That creates a granite wall forcing airflow up and over the range—orographic lift, which is often referred to as upslope flow. Sometimes also referred to as a snow-maker wind, upslope flow cools and condenses the air, creating weather. The opposite effect is called downslope flow where the wind travels down the mountain range. Downslope flow has a warming and drying effect. 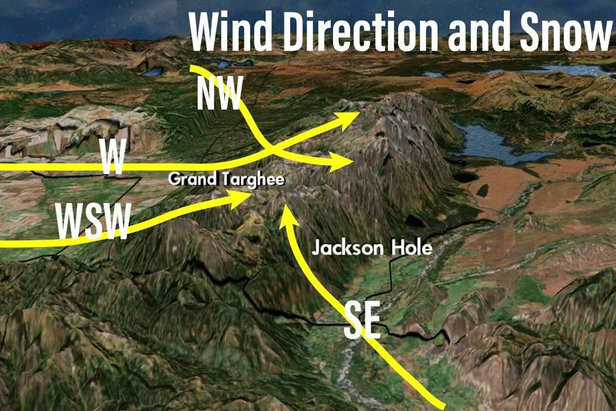 The ideal wind directions for Grand Targhee and Jackson Hole (shown on the graphic) include west, west-southwest, northwest and southeast wind directions. Wind directly from the east and south both produce downslope drying because it runs into other topography and higher peaks prior to reaching Jackson Hole/Grand Targhee. For example, an east wind runs into the Wind Rivers. That air is put through the entire moisture cycle before reaching Jackson Hole/Grand Targhee. The ideal wind directions for Grand Targhee and Jackson Hole include west, west-southwest, northwest and southeast wind directions. Tahoe is generally in good position to receive heavy precipitation from the Pacific, but adding the right wind direction is also critical. Ski resorts around the lake interfere with each other's snowfall production. As an example, an upslope for Squaw Valley | Alpine Meadows can be a partial downslope for Heavenly. The ideal wind directions that set up a clean upslope flow for solid snow conditions in the Lake Tahoe region depend on what resort you're skiing. 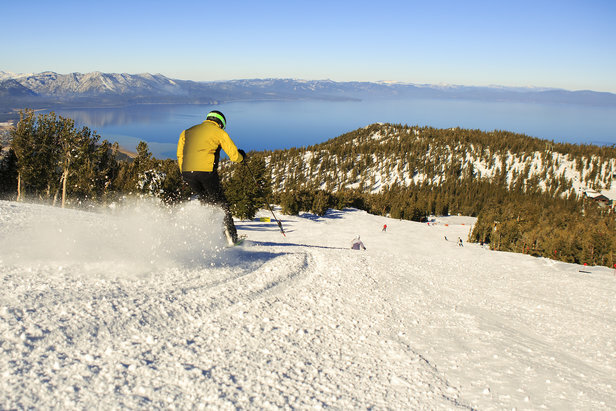 Generally, a west-southwest wind is best for the resorts on the west side of the lake, such as Squaw Valley | Alpine Meadows and Sierra at Tahoe. This wind can also have a smaller positive effect on the other resorts around the lake. A northwest wind benefits Heavenly, Mt. Rose and Diamond Peak. A southeast wind can also benefit those same resorts on the east side of the lake. The ideal wind directions that set up a clean upslope flow for solid snow conditions in the Lake Tahoe region depend on what resort you're skiing. 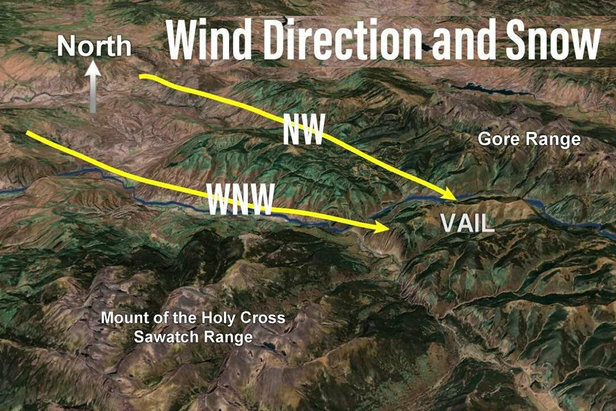 The Gore Range to the north and the Sawatch Range to the south play critical roles in blocking and redirecting wind flow. Vail mountain itself offers a smooth upward glide surface for the right wind directions, and the back bowls are in perfect position to receive upslope snowfall. 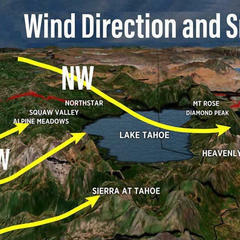 The ideal wind directions for creating the best snow conditions at Vail Ski Resort are west-northwest and northwest. In Vail, those wind directions yield a clean upslope flow that doesn't hit other higher terrain prior to reaching Vail mountain. Wind directly from the north, south and east produce downslope drying off higher peaks. Other factors, such as temperature profiles in the atmosphere, can enhance these effects (but that's fodder for a future weather discussion). 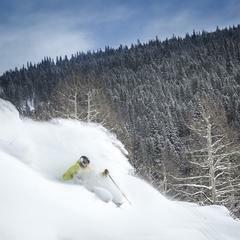 The ideal wind directions for creating the best snow conditions at Vail Ski Resort are west-northwest and northwest. 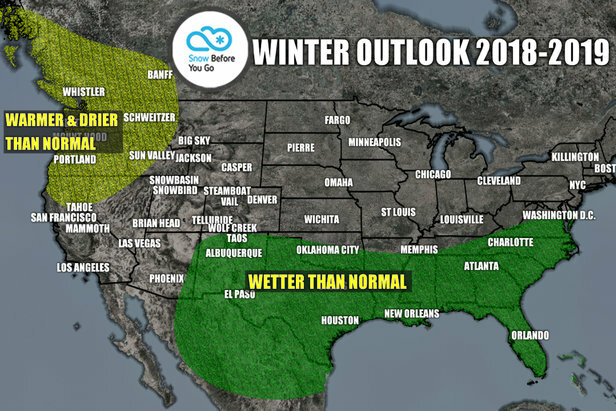 What is El Niño and How Does it Influence Snowfall in the United States?